A better tomorrow begins with a single step. By going back to school, you’re investing in your dreams. You’re working towards a goal that can positively impact your family’s livelihood. However, as a mother, by going back to school you’re not only actualizing your own educational and career goals—you’re also inspiring your children to believe in the power of a good education. To reach higher and dream bigger. You, and your children, are daring to be brave. You are busy. From raising a family to building a career, you may not have much free time available to yourself. However, there are a wide array of online and on-campus degree programs available that are designed for working adults and parents. You can find a program that fits your lifestyle, making it easier to balance your personal responsibilities while also pursuing an education. If you’re considering going back to school, make sure to seek out resources, tips, and information on how you can help make your educational transition a successful one. From simple time management tips to critical information about financial aid, this guide will help you make an informed decision and empower you to take that pivotal first step. You’re planning ahead. Looking towards the future. You want to learn and you want to sharpen your skills. You want to accomplish something substantial and create a better tomorrow. Mothers, like all parents, want a positive future for their families. By going back to school, you’re aiming for career growth, financial benefits, and that important sense of satisfaction that comes from achieving a challenging goal. By choosing to go back to school, you will start down the path towards not only advancing yourself, but also your family as a whole. The facts support your choice to go back to school. For example, studies show that college graduates are more likely to be employed, remain employed, and boast higher annual and lifetime earnings as compared to those who don’t hold a college degree. And they’re also more likely to have access to employer-sponsored pension and health insurance plans, as well. Women with bachelor’s degrees earn on average $630,000 more over their lifetimes than women with only a high school education. Women with graduate degrees earn $1.1 million more over their lifetimes than women with only a high school diploma. But a degree offers more than just future financial security. As a mother, by pursuing a college degree, you may inspire your own children to pursue a higher education. You are leading by example, and making an impression on the ones that matter the most. Research has shown that with a college degree, you’re investing in your health: Earning a degree can positively impact your overall life expectancy, as individuals with college degrees have been shown to exhibit healthier behaviors, are able to access health information and navigate the national healthcare system more efficiently, and feature overall improved psychological well-being as compared to those who lack a college education. The potential challenges of adding school into the mix of motherhood can seem sizable at first. But every challenge comes with a creative solution and a chance to grow. For moms like you daring to be brave and choosing to go back to school, it’s about the end goals: pursuing a satisfying career, advancing your abilities, increased financial stability, and setting an example for your children. Here are some of the top potential challenges that parents may face when going back to school. With a few tips and the support of your family and friends along the way, you will overcome these challenges, and enjoy a rewarding and fulfilling experience. The elusive work-life balance may seem tougher with school added to the mix. With children, work and family responsibilities, you might be wondering how you will be able to manage it all. Solution: A growing number of reputable, well-established, non-profit higher education institutions are offering online programs—in part to support the needs and demands of today’s nontraditional college students. Online programs are usually quite flexible: students can often complete their coursework not only on their own schedule, but also from the comfort of their own homes. This makes it easier for you to maintain an effective personal balance while pursuing a full-time or part-time education. 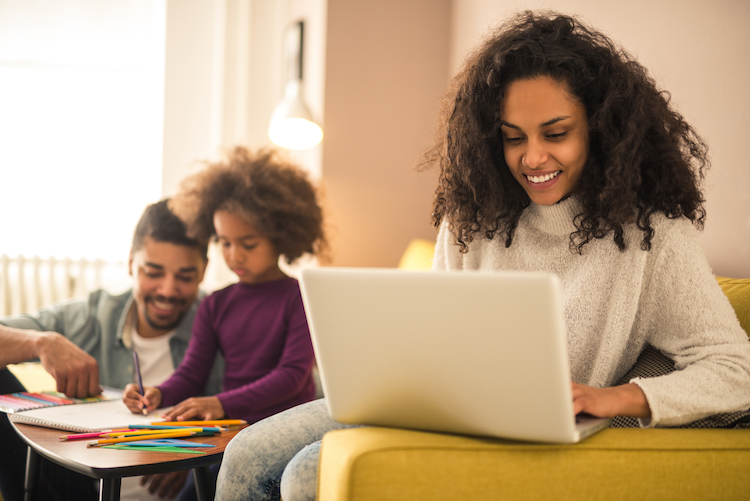 As a mom returning to school, you may think that you’re not prepared for the amount of coursework that comes with pursuing a degree and don’t have an idea of what to expect. Solution: Don’t be afraid to ask questions and get the information you need before enrolling. Speak with an enrollment advisor (EA)—they can help you gain an idea of what to expect with your coursework. Also, reach out to alumni. These former students are able to offer insight into what prospective students might expect from their course loads. Alumni organizations can help connect you with former or current students through student portals and social media platforms, such as LinkedIn. Moms going back to school are sometimes hesitant to consider higher education due to the costs, especially if they haven’t explored the available options for financing their education. Solution: Many universities and colleges often provide guidance to students on an individual basis. For instance, you can speak with an enrollment advisor, and they may be able to address any questions you might have concerning loans, grants, or scholarships. Advisors can point you in the direction of financial aid options that are intended for mothers going back to school. Furthermore, you can develop a savings or budget plan for your time during school to help ensure that you meet all of your expenses. Lastly, most online programs allow you an element of flexibility with your course scheduling—this can allow you to maintain a full-time job to support yourself and your family while also pursuing an education on a full-time or part-time basis. One of the most common sources of information on college for many people are friends, family, and coworkers. However, few speak directly with an admissions or enrollment advisor or research colleges online. Solution: Advisors understand the ins-and-outs of the college programs they represent. Talk with them online, via email, or over the phone to ease your concerns. Additionally, you should visit your desired college’s website to learn more information about the school’s curriculum and admission requirements. Many schools host informational webinars to prepare you for enrollment and connect you with faculty, advisors, and alumni. It’s also a good idea to follow the college’s social media channels so you can become a little more familiar with the school’s culture and image. Tuition and convenience shouldn’t be your only determining factors when choosing a school. In the hunt for the right school, many prospective students don’t consider a school’s graduation rate, accreditation, or the types of jobs graduates accept—these metrics are just as important, if not more so, than convenience or tuition. Solution: Speak to a counselor or advisor and do some research to learn more about a school’s graduation rate and accreditation. Information about a school’s accreditation, average graduation rates, and more can be found on their website. When you decide to go back to school, it’s vital to take a moment and assess all of your options and potential concerns. Once you’ve done so, and you’ve done the proper amount of research to address any of your concerns, then you can make an informed decision about going back to school. Goals: What do you want to achieve with your college degree? Remember, an enrollment advisor can help you develop a better understanding of what you can do with your degree following graduation. Time: Between working and raising a family, you might need to balance your priorities and your time differently. Evaluate the amount of time you have open that you can devote to pursuing an education. Online programs are excellent for those with limited time and/or critical work responsibilities. Finances: Consider your financial obligations. If you need to apply for a loan, grant, or scholarship, then do reach out to an advisor at the university you are considering for additional guidance. Family: It’s important to understand how going back to school may impact your relationship with your spouse, significant other or other family members. Communicate with them regarding why you want to go back to school, and why it is beneficial for the whole family. Resources: Do you have what you need to get started with your coursework? If you are enrolled in an online program, do you have a decent computer? Or, if you are enrolled in an on-campus program, do you have a way to physically get to class? Balancing motherhood, student life, and a career is possible—and easier—with proper time management and effective study habits. If you’re going back to school, these new changes can be exciting and invigorating for both you and your family. With the support of your family, advisors, professors and peers you’ll be motivated to excel in your studies. Build and maintain a relationship with your student advisor to stay encouraged and motivated as you progress through your degree program. Make smaller, easy-to-achieve goals to see the progress you are making day-by-day. Work with your professors: Seek them out during office hours to discuss your progress, and if there are areas of study that you can improve on. Additionally, online courses and their professors usually offer scheduled virtual office hours, making it relatively straightforward for online students to have a one-on-one conversation with their professors. Get together with your peers for a study session. Remember, with social media, group chats and video chat software, you can communicate with your classmates entirely remotely and efficiently. Turn to friends and family for encouragement and reward yourself for small victories, like a completed project or paper. Study with a classmate, coworker, or even a friend who is also going back to school. Designate a certain spot within your home as your “school” or a place where you can focus and study in peace. If your home is often busy, then consider visiting your local library or coffee shop for some peaceful study sessions. Consider early mornings as a refreshing time to dig into your coursework. Adapt your study methods to your learning style. If you’re a visual learner, create charts, PowerPoint presentations or flash cards. If you’re someone who enjoys taking notes, then make sure to take consistent notes during class lectures or even during your group study sessions. Block off time. While you might set aside a certain amount of time each day to attend your classes, you should also block off some time each day for your reading assignments and other coursework. By working on your assignments a little bit each day, you can avoid becoming overwhelmed. Plan meals with your children. Turn it into a fun activity by creating a menu together. Use digital calendars to keep track of your deadlines, and spreadsheets, mobile apps, or even cloud storage systems like Google Drive to efficiently organize your notes, assignments, and other important school-related documents. Study while the kids sleep. The house is quiet and free of distractions, allowing you to focus and plan the days ahead. Give the kids activities. Create fun assignments for them and tell them that they’ll be helping you with your homework by drawing pictures. Find ways to multi-task. Coursework has entered the digital age, and you can get creative about how you think about incorporating studying into your day. In a waiting room? On your lunch break? Commuting by train? Utilize that time to do things like contribute to a discussion group from your phone, catch up on readings, check-in with your professors or watch assigned videos. Fortunately, nonprofit organizations, private companies, and various government initiatives are helping turn college dreams into a reality. Certain grants, scholarships, and other resources provided by charities are geared especially towards moms going back to school. By applying for financial aid, mothers can help to defray some of the costs associated with pursuing a degree. Visit fafsa.gov and submit a free application for Federal Student Aid (FAFSA). Visit your state’s Department of Education to learn about state level financial aid for students. Talk to your school’s financial aid counselor to learn more about your financial options. Research local charities that help with childcare and provide tuition assistance. Speak to your current employer about tuition reimbursement. Check with industry-specific organizations as many offer scholarships and grants to support future graduates entering the industry. Financial assistance is not out of reach for mothers who are eager to go back to school. In fact, there are a number of scholarships available that are dedicated to helping mothers pursue an education. Here is a brief sampling of popular scholarships for mothers who are keen on returning to school. The Philanthropic Education Organization Program for Continuing Education – offers grants to mothers going back to school after taking time off to raise children. Patsy Takemoto Mink Education Award – provides financial assistance to low-income women, especially mothers. Soroptimist Live Your Dreams Award – is geared towards women who are the primary breadwinners in their families. J.A.M.E.S., Inc. Scholarship – provides financial assistance to single teen mothers planning on pursuing a higher education. Rosenfeld Injury Lawyers’ Annual Single Mother Scholarship – offered to single mothers working towards an undergraduate degree and/or a law degree. The Educational Foundation for Women in Accounting – offers scholarships to women pursuing undergraduate, graduate, and postgraduate education in the field of accounting. Jeannette Rankin Women’s Scholarship Fund – is for women 35 and over who are U.S. citizens or residents, are enrolled in or accepted at a regionally accredited school, and are pursuing a degree in a technical or vocational education. Open to those pursuing an associate’s or first bachelor’s degree. In addition to scholarships, there are a number of grants available for moms at the federal, state, and institutional level that can help ease the financial strains of going back to school. Pell Grant – is based on financial need and available to both undergraduate and graduate students. Also known as former President Obama’s ‘Moms Return to School’ grant. The PEO International Continuing Education Program – provides grants to mothers who are eager to return to higher education, but are unable to do so due to financial constraints. The Federal Supplemental Educational Opportunity Grant – is available to undergraduate students and gives priority to those already receiving the Pell Grant. State – Grants will vary by state, but visiting the state’s Department of Education would be an excellent start. Financial Aid Office – Contacting the institution’s financial aid officer can help mothers get a better understanding of how the school can help, as well as other options they may not be aware of. In addition to scholarships and grants, there are a number of charities available to a single mothers and mothers in need. These charitable contributions can assist in areas of a mother’s life outside of education. Single Mothers Grant Organization – A directory of single mother grants helping with rent, utility bills, medication, childcare, housing, medical bills, mortgage, and education-related expenses. Single Parent Alliance & Resource Center – A nonprofit organization offering various programs for single parents and their families. Mothers Helping Mothers – Run entirely by volunteers, this nonprofit organization has been providing clothing and baby items free of charge with the help of donations, grant funding, and private contributions since 1990. The additional finance assistance from this organization could prove beneficial to mothers who are balancing both their education and supporting a family. By going back to school, you are one step closer towards building a better future. Remember, the the difference between dreaming and pursuing is in a single step. To learn more about how you can start the process of going back to school for a bachelor’s, master’s, or doctorate degree, contact an enrollment advisor today. With the support of friends and family, financial assistance from various organizations, and the guidance of a school counselor and an enrollment advisor, you’ll be well prepared to excel in your studies and pursue a higher education.